Prefab home and tiny house enthusiasts, we’ve looked at a few houseboat options so far, but here’s a girl named Bonnie who actually did it — she lived in a houseboat (which she build, DIY style), inexpensively (very inexpensively) because she wanted to live on the river. She looked at tiny houses in her search for a home to buy, but then she got talking with a friend who was a boat builder. 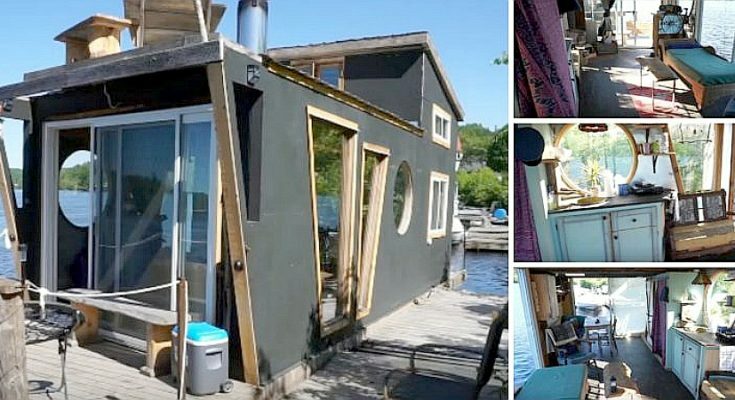 The talk led her to decide to build a houseboat. She bought the pontoons and started building. They’re ABS plastic pontoon floats, and there are 5 30 footers. Water enters the pontoons to weigh them down into the water to make it steady. There is 20,000 pounds of flotation on the houseboat. The lights all run from a deep-cycle powering 12 volts to the lights, and a pump draws water into the tap for dish washing and so on. The windows are all custom built double pane with argon. She has a small old stove for cooking. There is no fridge yet on the houseboat, so the girl is considering getting solar power, mostly for this purpose. All the electricity is controlled by 4 switches, including the houseboat’s power. Yes, it has a 60 horsepower motor on it to move it. The bathroom has a shower and a waterless, composting toilet with a 12-volt pump. The back of the houseboat has a deck with storage boxes for gas tanks and anchors. The room has a grate floor (yes, a metal grate) so dust and dirt falls through (no sweeping), and to keep the room cool. The houseboat also has a rooftop patio, covered with cedar, where there might be solar panels put in. The roof for the upper story actually lifts up and folds down (tough to explain), but in short this allows them to lower the roof to 13 feet. 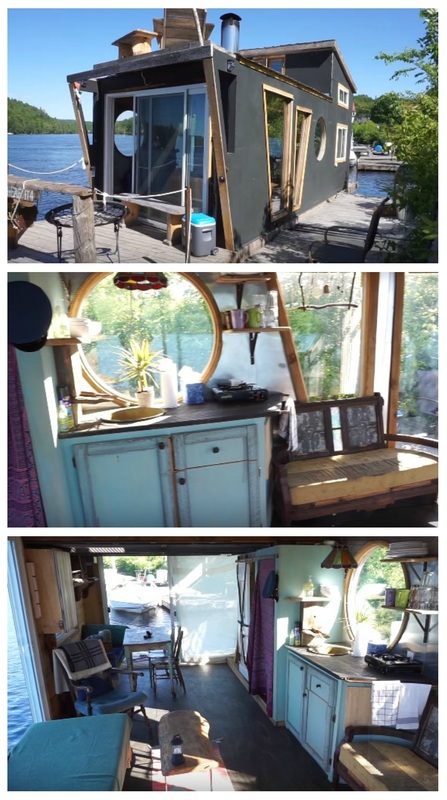 It took the houseboat builder, Denis Tremblay, about 3 or 4 months to build this unit, and the owner rents it out on AirBNB sometimes as well. For more houseboats and other interesting homes, find them in the Building Homes and Living directory.